Veneers are thin pieces of porcelain or plastic cemented over the front of your teeth to change their color or shape. Veneers are used on teeth with uneven surfaces or are chipped, discolored, oddly shaped, unevenly spaced or crooked. Little or no anesthesia is needed. Veneers have a longer life expectancy and color stability than bonding, and highly resist permanent staining from coffee, tea, or even cigarette smoking. For some, Veneers are a permanent whitening for the bright smile they always wanted. The new Snap-On Smiles by Denmat give patients an easy, painless and very affordable way to obtain a beautiful smile in only two appointments. Snap-On Smiles are thin and strong with the look of natural teeth. You can eat and drink with a Snap-On Smile and they are easy to care for. They can be a temporary or permanent cosmetic solution for either the upper, lower teeth or both arches. 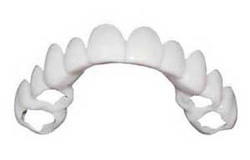 Veneers are usually made by a dental lab technician working from a model provided by our office. Traditional Veneers are usually irreversible because it`s necessary to remove a small amount of enamel from your teeth to accommodate the laminate. Lumineers can be reversible since sometimes no tooth structure or minimal tooth structure is removed prior to placement. Both veneers can mask undesirable defects, such as teeth stained by tetracycline, by an injury, or as a result of a root-canal procedure, and are ideal for masking discolored fillings in front teeth. 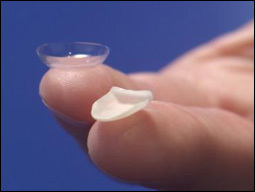 Patients with gaps between their front teeth or teeth that are chipped or worn may consider porcelain veneers. Typically, veneers entail at least three appointments: diagnosis and treatment planning, preparation and bonding/delivery. During the tooth preparation visit, usually lasting one to two hours, the teeth are lightly buffed to allow for the small added thickness of the veneer. Usually, about half a millimeter of the tooth is removed (which may require a local anesthetic). During the same visit, a mold is taken of the teeth, and sent to the laboratory for the fabrication of the veneers. During the final "bonding" delivery visit, also about one to two hours, the veneers are "tried in" to check their fit and get a sense of the shade or color. While the veneers are resting on your teeth, they can be adjusted with various shades of cement to match the color of your teeth. 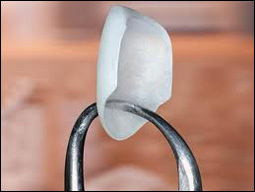 To apply the veneer, the tooth is cleansed with specific chemicals to achieve a bond. Once a special cement is sandwiched between the veneer and tooth, a visible light beam, or laser, causes a catalyst to be released, hardening the cement. Lumineers by Denmat now come with a Life Time Guarantee against breaking. For more information, please visit their website Lumineers.